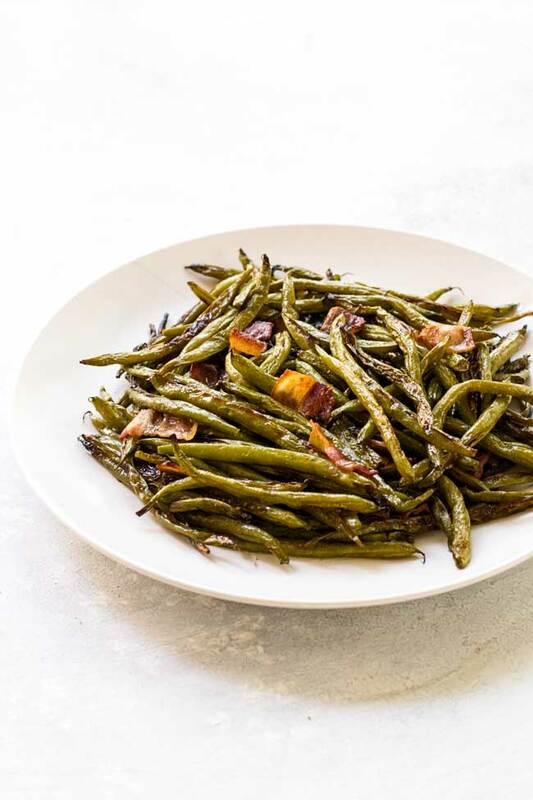 Green beans roasted with smoky bacon and tossed with a dill vinaigrette. 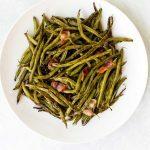 These roasted green beans are a great side dish for holiday meals, but easy enough for weeknight dinners. While I’ve certainly made my fair share of what is best described as high-maintenance side dishes (and I still go back to that well from time to time), these days I tend to favor dishes that are simpler to make for a couple of reasons: 1) Simpler sides don’t tend to overpower whatever main dish they’re paired with and 2) Simple in my book usually means roasting and I never get tired of roasted anything. And it was a few weeks ago, while I was playing around with a green bean recipe idea, that my mom mentioned a recent recipe, clipped from our hometown newspaper, where brussels sprouts are roasted with pieces of bacon that are scattered of the top. 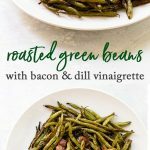 At the time, I was a bit obsessed with roasting green beans and looking for a way to take them from just a pan of roasted veggies to something a bit more exciting and the bacon on the top idea was just the thing. While the brussels sprouts recipe she used went down a whole other path resulting in a completely different dish than what I’m sharing today, it was that simple idea to cook the bacon on the sheet pan with the green beans that took these roasted green beans to a whole new level. I like to combine the ingredients in a small canning jar. I just top it with the lid and shake the jar until the dressing is combined. As the green beans roast the bacon released it’s fat coating the green beans with a ton of flavor. Be sure to give the green beans a good toss to ensure they are evenly coated in the fat before tossing them with the dressing. The combination of flavors – mustard, fresh dill, bacon, and lemon – is delicious and I like to serve them while the green beans are still hot. 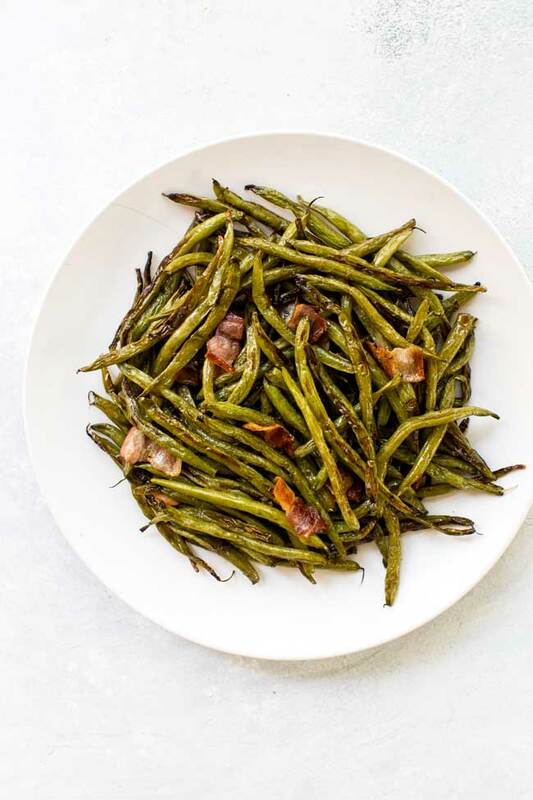 Fresh green beans roasted with some bacon until they are caramelized and tender. Toss them with a tangy dill vinaigrette for an easy side dish. Preheat oven to 400 degrees. Spread the green beans on a baking sheet and drizzle the olive oil over the top. Gently toss the beans to coat them with the olive oil. 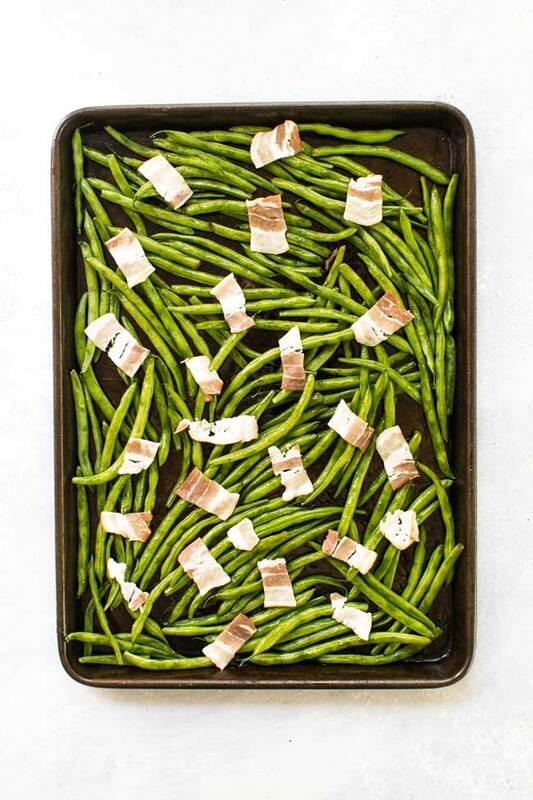 Place the bacon pieces on the green beans. Roast the green beans for 15 minutes. Stir them around the pan and roast them for another 10 minutes. While the green beans roast, make the dressing. Whisk the lemon juice, olive oil, dill, mustard, salt, and pepper until combined. When the beans are done roasting season them with a couple pinches of salt. Drizzle the dressing over the top of the beans and, using tongs, gently toss them to coat them in the dressing. 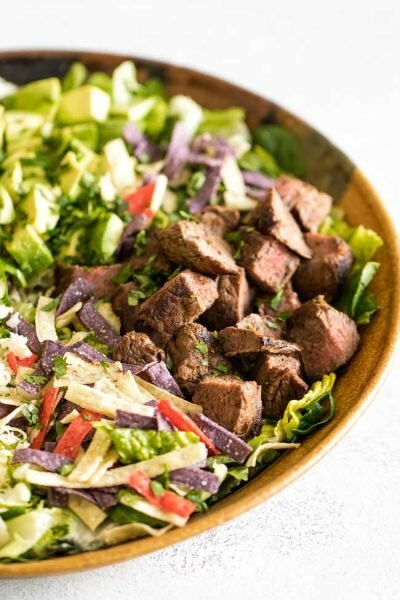 I made this recipe tonight and loved it! I didn’t have dill so just made the dressing without it. Delicious – what a great idea. Thank you. Made this one tonight & it’s a keeper! Loved the vinaigrette, added an extra zip! will make this again for sure! !